August 2018 update: As hunting season approaches, conditions have improved from last season. We’re seeing a lot of young pheasants and ducks, and an increased number of potholes. Hunt Dakota has 12,000 acres of land for you to hunt in Kidder County, the heart of the prairie pothole region in central North Dakota. This area is the largest duck factory in North America. At the opening of the season we have local ducks–and as time goes on–migrating ducks, with enough big water and fields to pull them in (see our maps). In recent years we’ve grown winter wheat, spring wheat, flax, oat/pea mixture, blue corn, millet, lentils, and buckwheat. Ducks common to our area include Blue Bill, Ring-necks, Buffleheads, Canvasbacks, Redheads, Mallards, Pintails, Gadwalls, Spoonbill (Northern Shoveler), and Wigeons. Crane are common and are seen by Horsehead Lake on the southern end of our land, in our fields around the main yard, and up in the fields next to the rough virgin prairie. Crane hunting is noted as one of the most challenging hunts. Pheasant are in abundance, and there are Sharp Tail Grouse all over our native grass hills. If goose is your hunt, the numbers are staggering. 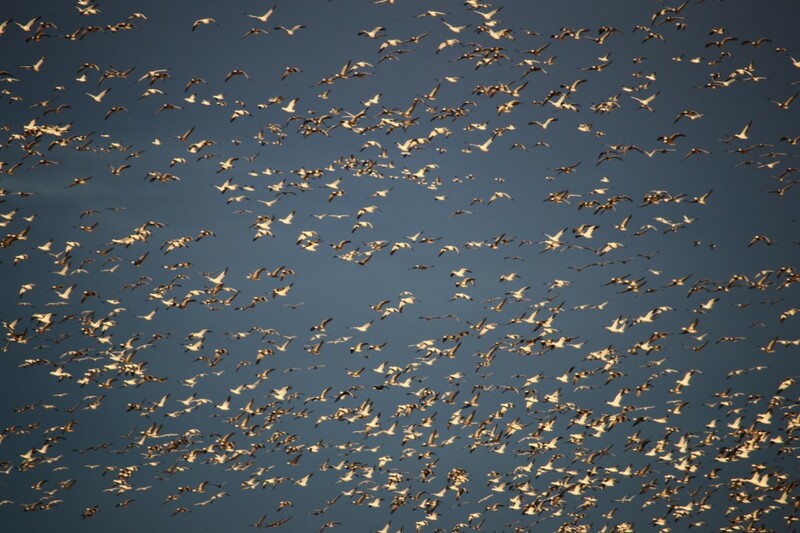 Snow geese (blue geese), Canada geese, Giant Canada geese, Greater White Fronted geese (Speckle Belly), and Ross geese are some of the geese that nest here, or migrate through. White Tail deer and coyotes are everywhere. This is like paradise if you’re a hunter. It’s like punishment if you’re a shopper.